So huge was Greg Lake’s talent, he helped birth TWO seminal progressive rock giants; King Crimson and ELP. His supple voice could handle the psychotic menace of Crimson’s “Twentieth Century Schizoid Man” or the romantic nuance of the ELP ballad “C’est La Vie”. He once described his bass style as trying to replicate the bottom end of a Bosendorfer grand piano. With ELP he not only took on the task of anchoring a power trio consisting of virtuoso musicians Keith Emerson and Carl Palmer, he also wrote the hits (“Lucky Man”, “From The Beginning”, “Still You Turn Me On”). For good measure, Lake also played expert guitar and installed himself as producer. Later in his career he was first call to join the prog-pop super-group Asia as John Wetton’s replacement when the Vocalist/Bassist suddenly left the band prior to a Japanese tour. Ironic, since Wetton was Greg Lake’s eventual replacement in King Crimson in the early 70’s. Lake’s music adorns our lives every December when the holiday evergreen “I Believe In Father Christmas” is rolled out. 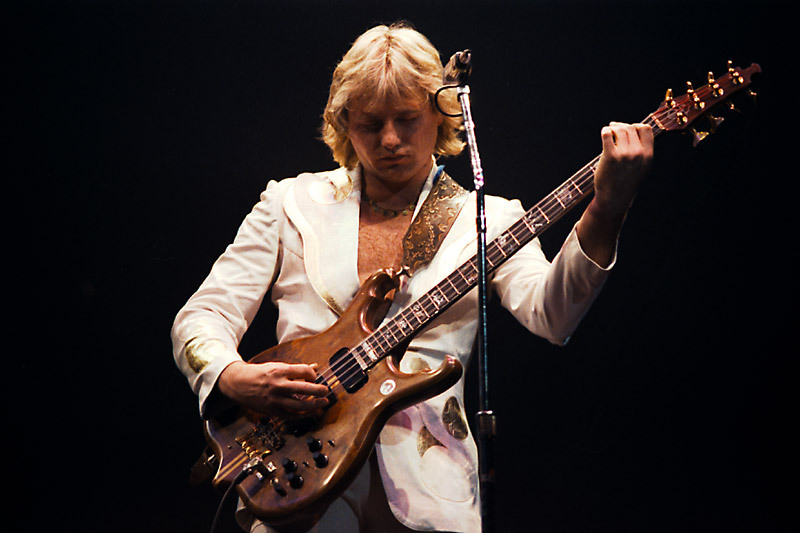 Greg Lake’s voice and playing had a grandeur that fit perfectly with the heavy music produced by ELP and King Crimson. ELP were constantly pushing the envelope of what could be achieved by a simple rock band. In 1977 they mounted a monstrous tour that included their own hand-picked symphony orchestra that traveled with the band on the road. At that time, it was the largest tour ever attempted. The logistics and finances became too unwieldy and the orchestra was excised by the band part way through in favor of a more conventional concert format. Fortunately their concert in Montreal’s Olympic Stadium was captured on film in all it’s profligate glory. ELP and the progressive rock genre had reached the mountain top. Neither the band or the genre would ever be this popular again. Not a bad guy to end up being #2 to 🙂 Reblogged this on Ladies of the Lake! E.
Now I have to know, what songs did Lake use an 8-string bass on??? All I know is that he used the 8 string pretty much the whole gig on the 1977 Works tour. On record however, I think he pretty much stuck with a Fender Precision early on and about the time of Brain Salad Surgery he switched to a Gibson Ripper (or was it a Grabber?) horrible names, but fairly decent instruments. Where the HELL is Chris Squire in all of this? He should have figured into the top ten EASILY!! List focuses on singer/bassists who were also the front men of their respective groups.